This is a typical Spanish-style salad, but it would go well with almost any menu. Place thinly sliced red onion in a medium bowl; cover with ice water, and soak 15 minutes. Drain well. Carefully remove rind and white pithy part of rind from oranges; discard rind and pith. Cut each orange in half vertically; remove white pithy core portion, and discard. Cut oranges crosswise into 1/4-inch-thick slices, reserving about 1/3 cup juice for dressing. 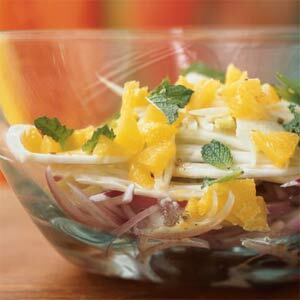 Layer red onion, thinly sliced fennel, and orange evenly in a bowl or on a platter, and sprinkle with fresh mint leaves. Combine reserved juice, plain fat-free yogurt, juice concentrate, and remaining ingredients in a small bowl, and stir with a whisk to combine. Drizzle evenly over salad; serve immediately.